5 Gloucester is located on the east side of Gloucester, between Beacon and Marlborough, with 3 Gloucester to the north and 7 Gloucester to the south. 5 Gloucester was designed by architect Frederic H. Moore and built ca. 1873, one of three contiguous houses (3-5-7 Gloucester) with brick façades. 3 and 5 Gloucester were both built with three stories plus basements. 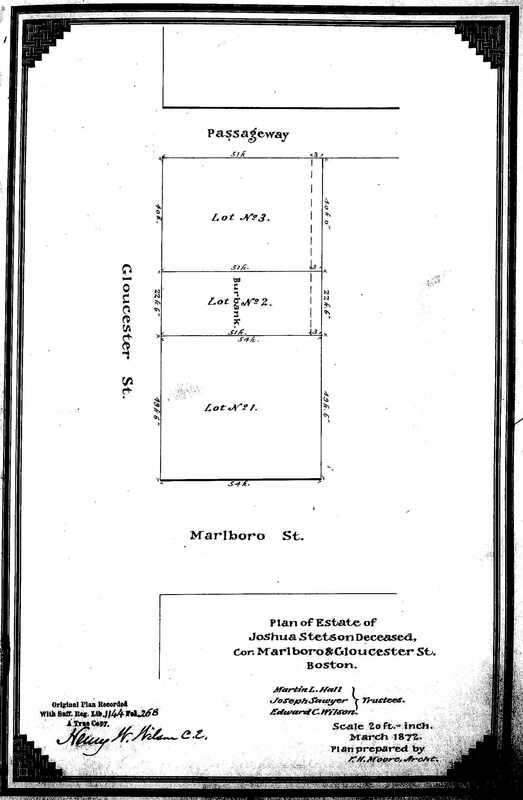 7 Gloucester either was built with four stories plus a basement or was remodeled soon after it was built to add a fourth story (it is shown as one story higher than 3-5 Gloucester on the 1887 Sanborn map). Click here for an index to the deeds for 5 Gloucester. On February 1, 1873, 5 Gloucester was purchased from Samuel Ames and Frederic Moore by wine and liquor merchant John Burbank. He and his wife, Susan Maria (Snelling) Burbank, made it their home. They previously had lived in Chelsea. The Burbanks continued to live there during the 1880-1881 winter season, but were living elsewhere during the next two seasons, when 5 Gloucester was the home of dry goods commission merchant Frank Thaxter Wendell and his wife, Helen (Staniford) Wendell. They previously had lived in Jamaica Plain. They moved from 5 Gloucester after the 1882-1883 season and by 1885 were living at 84 Highland. By the 1883-1884 winter season, 5 Gloucester was the Burbanks’ home once again. In July of 1884, their daughter, Lilla, married in England to Arthur Augustus Boswell Eliott, who became a stockbroker in New York City and , in 1910, inherited the Baronetcy of Stobs in Roxburghshire, Scotland. It appears that the Burbanks may have separated, inasmuch as she was listed alone at 5 Gloucester in the 1884 and 1885 Blue Books, but he continued to be listed there in the City Directories through 1886 (his business failed in the fall of 1886). On December 13, 1886, 5 Gloucester was acquired from John Burbank’s assignees in bankruptcy and mortgage holders by Mary S. (Huntington) Winslow, the wife of William H. (Farren) Winslow, a dealer in oils. They previously had lived at 7 Walnut. William Winslow was the son of Henry Farren and Catherine (Kate) Mary (Reignold) Farren. They both were actors, and Kate Reignold in particular achieved widespread popularity in the 1850s and 1860s. Henry Farren died in St. Louis in January of 1860, soon after his son, William, was born. Kate (Reignold) Farren remarried in June of 1861 to Erving Winslow of Boston, and William took the name Winslow. William and Mary Winslow continued to live at 5 Gloucester until about 1889, but moved soon thereafter to St. Paul. Mary Winslow continued to own 5 Gloucester and lease it to others. The house was not listed in the 1890 Blue Book. By the 1890-1891 winter season, 5 Gloucester was the home of Ellen L. (Hayes) Meany, the widow of stone and marble dealer Edward F. Meany, and their son, T. Francis Meany, who continued to operate his father’s business. She previously had lived at 88 Chester Square. She continued to live at 5 Gloucester during the 1891-1892 season, but moved thereafter to 351 Marlborough. By 1892-1893 winter season, 5 Gloucester was the home of stockbroker Samuel Shober Gray and his wife, Caroline Balch (Weld) Gray. They previously had lived at the Hotel Victoria at 273 Dartmouth. They continued to live at 5 Gloucester during the 1898-1899 season, but moved thereafter to 79 Marlborough. 5 Gloucester was not listed in the 1900 Blue Book. By the 1900-1901 winter season, it was the home of Grace Howard (Beals) Wainwright, former wife of Amory Davis Wainwright. Their two children, Virginia Wainwright and Amory Howard (called Howard) Wainwright, lived with her. They previously had lived at 95 Mt. Vernon. On July 10, 1902, 5 Gloucester was purchased from Mary Winslow by Gardner Beals as trustee for the benefit of Grace (Beals) Wainwright and her father, John Whitney Beals. Gardner Beals, an attorney, was her first cousin, the son of Joshua Gardner Beals. Grace Wainright continued to live there during the 1903-1904 season, but moved thereafter to 710 Commonwealth. The trust continued to own 5 Gloucester and lease it to others. By the 1904-1905 winter season, 5 Gloucester was the home of Mrs. Mina F. Tempest and Mrs. M. Catharine Cook. Mrs. Cook was no longer listed there in the 1906 Blue Book. Mrs. Tempest continued to live there through the 1906-1907 season, and may be the same person as Miss Mina Tempest (sometimes styled as Mrs. Tempest) who was a milliner (modiste) and had a lingerie and dressmaking business in New York City from about 1915 until the early 1930s. She was named as co-respondent in a 1915 Manhattan divorce case (labeled the “one minute kiss” case by the press) in which Mrs. Laurien Robertson was granted a divorce from Edward F. Robertson. By the 1907-1908 winter season, 5 Gloucester was the home of George De Boketon Greene and his wife, Harriet Mumford (Campbell) Greene. He was a mechanical and electrical engineer. They continued to live there during the 1908-1909 season, but moved thereafter to 49 Chestnut. By the 1909-1910 winter season, 5 Gloucester was the home of banker Edward Howland Graham and his wife, Gladys Jacquelin (Smith) Graham. They had married in April of 1909, and 5 Gloucester probably was their first home together. Prior to their marriage, he had lived at 37 Commonwealth with his father and step-mother, John Martin Graham and Ludovica (Dimon) Morrill Graham. Edward and Gladys Graham continued to live at 5 Gloucester during the 1912-1913 season, but moved thereafter to Brookline. 5 Gloucester was not listed in the 1914 Blue Book. Grace (Beals) Wainwright’s father, John W. Beals, died in September of 1914, and on March 9, 1915, at Grace Wainwright’s request, Gardner Beals transferred 5 Gloucester from the trust to her two children, Virginia and Howard Wainwright. By the 1914-1915 winter season, it was the home of Austin Blake Mason and his sister, Marion P. Mason. They previously had lived at The Charlesgate at 535 Beacon. Austin Mason was a civil engineer working in heating, ventilating, and electrical work. In 1916, he joined the American Field Service as an ambulance driver in France. He returned in 1917 and continued to live at 5 Gloucester with his sister until his marriage in September of 1917 to Margaret Bliss. After their marriage, they moved to Weston. By the 1917-1918 winter season, 5 Gloucester was the home of Dr. William Russell MacAusland, a physician and surgeon, and his wife, Dorothy (Brayton) MacAusland. They previously had lived at 240 Newbury. They purchased 230 Marlborough in December of 1919 and moved there in 1920. During the 1920-1921 winter season, 5 Gloucester was the home of Mabel Kingsley (Jenks) Simpkins, the widow of Nathaniel Stone Simpkins, and their son, John Simpkins. They previously had lived at 62 Mt. Vernon. By the 1921-1922 winter season, 5 Gloucester was the home of wholesale lumber merchant Frank B. Witherbee and his wife, Mary H. (Chase) Witherbee. They previously had lived at 8 West Hill Place. They continued to live at 5 Gloucester during the 1922-1923 season, but moved thereafter to Brookline. On July 12, 1923, 5 Gloucester was purchased from Virginia Wainwright and Howard Wainwright by Agnes Bridget (Dowling) McEnany, the widow of Thomas McEnany. She lived there with her unmarried son and daughter, Herbert Charles McEnany and Mary Lorretta McEnany. They previously had lived at the Hotel Brunswick (Southeast corner of Clarendon and Boylston). On July 12, 1923, she transferred the property to Mary McEnany. 5 Gloucester was not listed in the 1924 Blue Book. On June 20, 1924, Albert W. Tolman foreclosed on a mortgage given by Mary McEnany and took possession of the property. On July 12, 1924, 5 Gloucester was acquired from Albert Tolman by George R. Shepard. He and his wife, Louella (Luella) W. (Dewing) Shepard, made it their home. He was agent for a wholesale men’s clothing company. They previously had lived at the Hotel Kempton at 237 Berkeley. On January 24, 1925, while the Shepherds were living there, the first floor of the house was damaged by a fire caused by a defective fireplace. On April 2, 1925, 5 Gloucester was purchased from George Shepard by James Jackson Storrow, III. 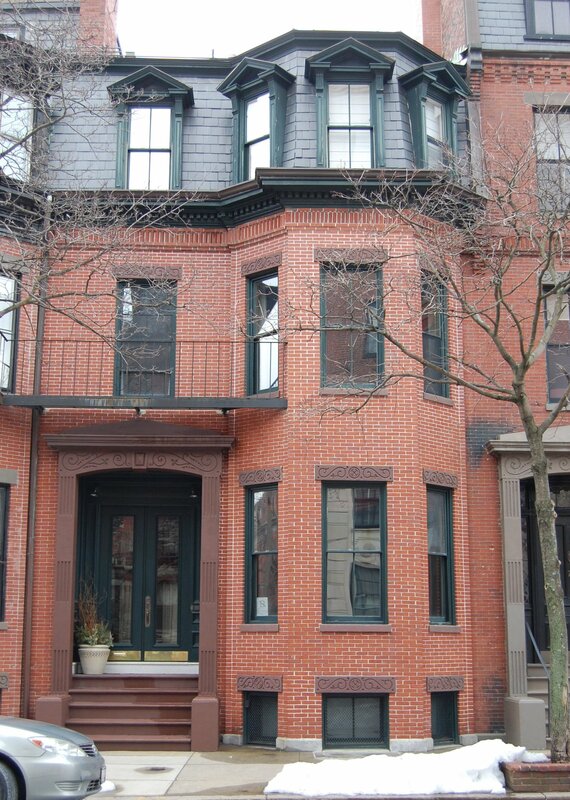 He and his wife, Margaret Randolph (Rotch) Storrow, made it their home. They previously had lived at 12 Hereford. At this time, he was referred to as James Storrow, Jr., because his father was still living but his grandfather was not. They also maintained a residence at Marblehead Neck. James Storrow was an electrical engineer. After his father’s death in March of 1926, he became trustee of the family estate. They continued to live at 5 Gloucester during the 1929-1930 season, but moved thereafter to Brookline. He continued to own the house and lease it to others. 5 Gloucester was not listed in the 1931 Blue Book and was shown as vacant in the 1931 City Directory. By the 1931-1932 winter season, it was the home of stockbroker Howard Morton Biscoe, Jr., and his wife, Adele (Thompson) Biscoe. They previously had lived in Brookline. They continued to live at 5 Gloucester during the 1932-1933 season, after which they moved back to Brookline. 5 Gloucester was not listed in the 1934 Blue Book. By the 1934-1935 winter season, it was the home of investment banker John Trowbridge Nightingale and his wife, Augusta Wahrendorf (Harrison) Nightingale. They had married in December of 1933 and 5 Gloucester may have been their first home together. They continued to live there during the 1936-1937 season, after which they moved to Hamilton. 5 Gloucester was shown as vacant in the 1937-1939 City Directories. On September 20, 1937, 5 Gloucester was acquired from James J. Storrow, Jr., by real estate dealer Francis Joseph Fisher. He and his wife, Lottie May (Lamprey) Fisher, lived in Medford. On May 28, 1938, 5 Gloucester was purchased from Francis Fisher by Eleanor Morris (McCormick) Collier, the wife of Sargent Francis Collier. They previously had lived in an apartment at 308 Commonwealth. A former magazine writer and editor, Sargent Collier was advertising manager of Symphony Hall. He later became an advertising account executive and was author of several books on the Bar Harbor-Mt. Desert area. They continued to live at 5 Gloucester in 1940, but had moved to 30 Bay State Road by 1941. They continued to own 5 Gloucester and lease it to others. By 1941, 5 Gloucester was the home of George Copeland and his partner, Horst Frolich. In 1940, they had lived in an apartment at 125 Beacon, and before that in New York City. George Copeland was an internationally acclaimed pianist, especially known for performing the works of Claude Debussy and various Spanish composers. By 1942, 5 Gloucester was the home of Henry Lee Higginson and his wife, Dorothy (Hedden) Fulton Higginson. They had lived at 192 Beacon in 1941. He owned a dairy farm in Lincoln and was in the US Navy Reserves. He later became a writer and poet. 5 Gloucester was shown as vacant in the 1943 City Directory. By 1944, 5 Gloucester was the home of Minot King Milliken, a woolens dealer, and his wife, Edith Fabbri (Clark) Milliken. They previously had lived in New York City. 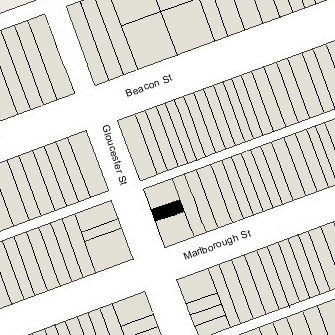 They continued to live at 5 Gloucester in 1946, but had moved to 76 Marlborough by 1947. On June 21, 1946, 5 Gloucester was purchased from Eleanor Collier by Juliet Edith Bertram (Greene) Carter, the wife of James Richard Carter, II. They previously had lived in Hollis, New Hampshire. 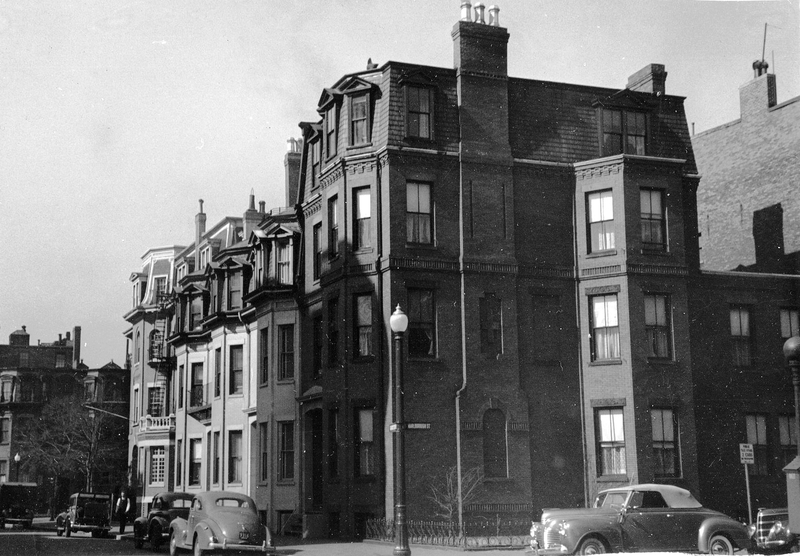 They continued to live at 5 Gloucester until about 1948. On July 29, 1948, 5 Gloucester was purchased from Juliet Carter by John H. Hill and his wife, Audrey (Booth) Hill. They previously had lived in an apartment at 10 Fairfield. He was vice president (and later senior vice president) of the New England Mutual Life Insurance Company. They continued to live at 5 Gloucester in 1952, but had moved to an apartment at 290 Commonwealth by 1953. On August 21, 1952, 5 Gloucester was purchased from the Hills by Richard Hugh Venn and his wife, Helen (Doyle) Venn. They previously had lived at 5 Poplar Place. Richard Venn was known as Diggory Venn, a name he adopted based on the character in Thomas Hardy’s Return of the Native. He was managing director of the Boston Festival of Arts and later headed the education division of the Museum of Fine Arts. Helen Venn was director of the publishing procedures course at Radcliffe College, a position she held for 33 years until her retirement in 1980. Diggory Venn died in June of 1987. Helen Venn continued to live at 5 Gloucester until shortly before her death in December of 1993.